Renée will be using the skills gained during her PhD training in her new position as a Scientific Associate at Chameleon Communications International. Congratulations, Dr. Symonds and we wish you the best of luck at your new job! Summer is almost half over and this year the Sussman Lab got to spend part of it with two enthusiastic young researchers: Gavi Shandler from Oberlin College and Robert Dinallo from Trinity High School. Both students hit the ground running to learn about and analyze EEG and human behavior data and we are really impressed with the results! The Sussman lab celebrated with our students at the Annual Summer Undergraduate Research Program and Einstein-Montefiore Summer High School Research Program Poster Session last Thursday, July 27, 2017. Check out the pictures of Gavi and Robert below! The Sussman laboratory is proud to celebrate the recent accomplishments of Renee Symonds and Kelin Brace. Renee was recently awarded the Predoctoral Individual National Research Service Award (F31) with funding from the National Institute of Deafness and Other Communication Disorders to pursue her research on the representation of unattended sounds in noisy environments. Kelin successfully defended his qualifying exam to advance as a PhD candidate in the MD-PhD track, and will begin work on his thesis research investigating multitasking in complex listening environments. It is now available online via this link. Check it out! The Sussman Laboratory is pleased to welcome Dr. Huizhen (Joann) Tang, PhD to the laboratory as our new postdoctoral researcher! We are excited to begin working with her to investigate the role of neural adaptation of visual circuits in perception. Please see below for a brief bio of Dr. Tang’s background and current interests. I received my PhD (2015) at Macquarie University (Sydney, Australia). My thesis work investigated the cortical processing of temporal information in children and adults using concurrent recordings of magnetroencephalography (MEG) and electroencephalography (EEG). At the present, I am working as a postdoctoral researcher with Dr. Sussman in a NIH funded project on neural adaptation. In particular, we aim to gain a better understanding of how adaptation of visual cortical circuits contributes to perception in young adults, combining event-related potentials (ERPs) and psychophysical measures. The Cognitive Neuroscience Laboratory at the Albert Einstein College of Medicine invites applications for a postdoctoral researcher. The goal of this newly-funded NIH project is to gain a better understanding of how adaptation of visual cortical circuits contributes to perception in young adults, combining EEG/ERP and psychophysical measures. The position is available for an initial period of two years, with the possibility of renewal. Candidates must have a PhD in cognitive neuroscience, biology, biomedical engineering, experimental psychology, or related field. The ideal candidate will have expertise in human EEG/ERP, visual or auditory perception, psychophysical testing, and programming experience (e.g., Matlab), as well as familiarity with computational and statistical methods for EEG analysis. Writing experience, a publication record, and the ability to work independently will be strongly favorable. Interested candidates should send their CV, a brief statement of their research interests and career goals, and the names and phone numbers of three references to Elyse S. Sussman (elyse.sussman@einstein.yu.edu). Review of applications will begin immediately and continue until the position is filled. Lions, Tigers, and Science, oh my! September 30, 2015. 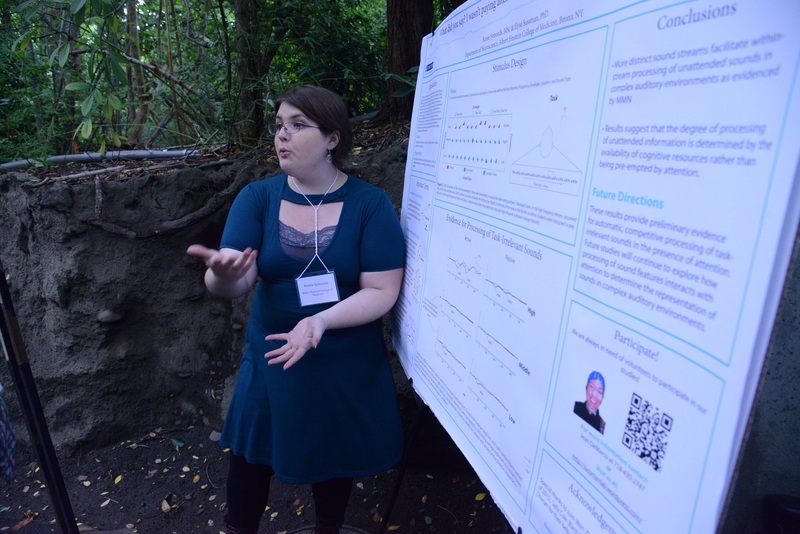 The annual Bronx Science Consortium Poster Session was held at the Bronx Zoo and research from the Sussman Lab was presented at the session by Renee Symonds. The poster session is a wonderful opportunity for scientists in and around the Bronx to share their research with each other and the community. There were a variety of posters there; everything from venomous lionfish to electrophysiology! Renee had a great time teaching her audience about Auditory Scene Analysis and Cognitive Neuroscience and having the opportunity to meet a lot of inspiring fellow scientists and engaged members of the community! If you missed it, you can read a recap here: http://bit.ly/1OhLMFH and keep an eye out for next year’s session! This summer went by fast and the Sussman Lab was happy to spend it with Juin Zhou (Fordham University) and Sally Cole (Bard College) investigating the role of stimulus features in Auditory Scene Analysis. Both students did great work and learned a lot! Pictured to above: [Top; left to right] Renee Symonds, Juin Zhou, and Sally Cole Celebrated with other Diversity Summer Students at an Appreciation Luncheon, July 29, 2015. [Bottom] Juin Zhou presented her work at the Summer Undergraduate Research Program (SURP) poster session on July 30, 2015. Her visit to the lab was made possible thanks to the Diversity Student Summer Research Opportunity Program, a collaboration between Albert Einstein College of Medicine and Fordham University. A new doctor among us! He will be moving on to the wards in 2015 to finish his MD. 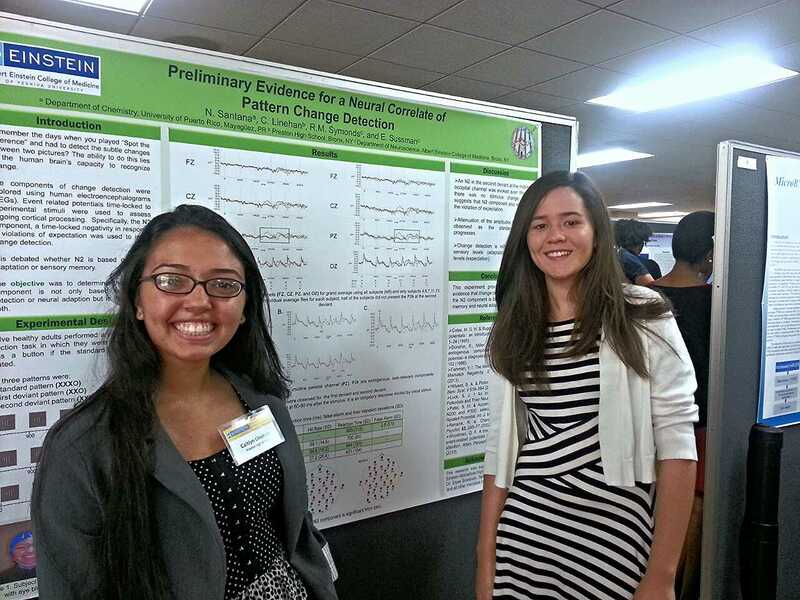 July 31, 2014 – The Sussman Lab was proud to celebrate with our 2014 summer students Nadja Santana and Caitlyn Linehan at the 2014 Summer Undergraduate Research Program and Einstein-Montefiore Summer High School Research Program Poster Session at Albert Einstein College of Medicine (Bronx, NY). They presented and explained their work in the lab to a varied audience of scientists and non-scientists alike. Great job! Our lab’s research is in the field of Cognitive Neuroscience and is focused on understanding the neural basis of auditory information processing in adults and children. We use non-invasive recordings of human brain activity (event-related potentials [ERPs]) in conjunction with behavioral performance measures, to investigate the processes and brain structures that contribute to the organization, storage and perception of a coherent sound environment.